An editorial in the New York Times prompts me to take a moment to present some arithmetic to that editorial board, our Attorney General, the Boston Globe, and the businesses and individuals who will pay for health care in Massachusetts under the terms of the recently announced deal between the AG and Partners Healthcare System. 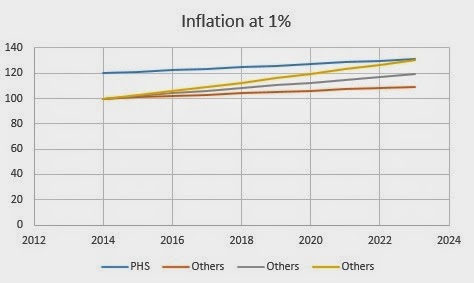 The deal allows PHS to have rate increases "only" equal to the rate of inflation for ten years. The Times mistakenly characterizes this provision by stating that the agreement "would at least slow the increases in Partners’ prices." 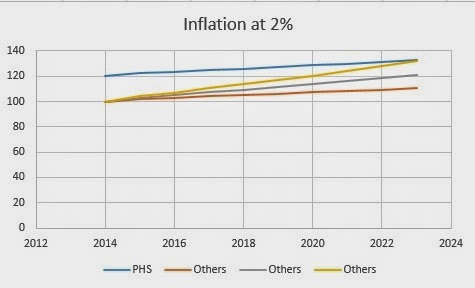 Well, maybe so and maybe not, but it is not the absolute level of the PHS rate increases that matters: It is the wide disparity between its rates and that of other providers. Some of us have argued that this agreement is a nullity because it will cement in the current rate disparity for years to come. This, combined with other features of the agreement, virtually guarantees PHS a continued revenue windfall for years to come. To illustrate, let's take the case of 1% annual inflation. Assume that PHS rates are currently 20% above its competitors. (That is conservative in many cases. For example, it reportedly receives over 40% more than Massachusetts Eye and Ear Infirmary to carry out the exact same procedures.) Let's present a chart showing what happens to the rate differential against other doctors and hospitals under three cases: They all get a 1% increase (red), 2% increase (gray), or a 3% increase (yellow). Hmm, in the best of cases, where the percentage rate increase granted to others is two or three times that received by Partners, the catch-up takes 10 years. Check my numbers. Use your own assumptions if you don't like mine. "The harm to the public will accrue more slowly under this deal, but the harm will occur." It's funny how even the simplest of arithmetic can be so elusive. I think the AG deal is just an eye opener with regards to the power of the smoke screen that has been created to thinly veil the hypocrisy that somehow patients will benefit from this. Here in Texas, a state where there is no certificate of need, hospital growth is rampant, and hospital systems sprout facilities everywhere. Physician practices are being rapidly absorbed by systems. As Bostonians and, to a larger degree, the people of Massachussetts see the black hole of the Partners Health System, we in Texas must regard the Texas-sized black hole forming around the nucleus of the Baylor Scott & White merger, and the potential tentacles spreading throughout Texas under the auspices of an "affiliation" with other systems.